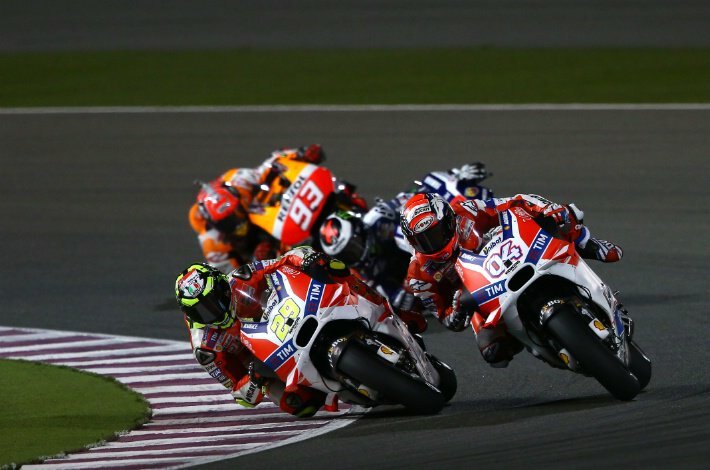 With new Michelin tyres and new unified electronics, the Commercial Bank Grand Prix of Qatar was set to not only start a new season of the MotoGP™ World Championship, but also begin a new era. Testing had given fans a preview of who was fast and what bikes were working well, but few had any idea what would happen as the lights went out on the first race of the 2016 season. Qualifying saw incredibly tight times, all of the top 12 riders within a second and the front row divided by under a tenth of a second. All signs pointed to it being a stunning race, Jorge Lorenzo (Movistar Yamaha MotoGP) lining up in pole position for the 62nd time in his Grand Prix career as he aims for back-to-back premier class titles for the first time. Just behind Lorenzo on the grid was Marc Marquez (Repsol Honda Team), the factory Honda rider having to push harder than ever to overcome several of Honda’s issues, adopting an even more wild riding style. Completing the front row was rising star Maverick Viñales (Team Suzuki Ecstar), the young Spaniard aiming to return Suzuki to the podium for the first time since 2008. Meanwhile, Valentino Rossi (Movistar Yamaha MotoGP) started in fifth, he and Lorenzo having exchanged words in the press after an incident in FP4. The scene was set for an explosive start to the season. As the lights went out it was Lorenzo who roared into the first corner ahead of Andrea Iannone (Ducati Team) and Dani Pedrosa (Repsol Honda Team). It was a poor start for Marquez who dropped back outside the top five. 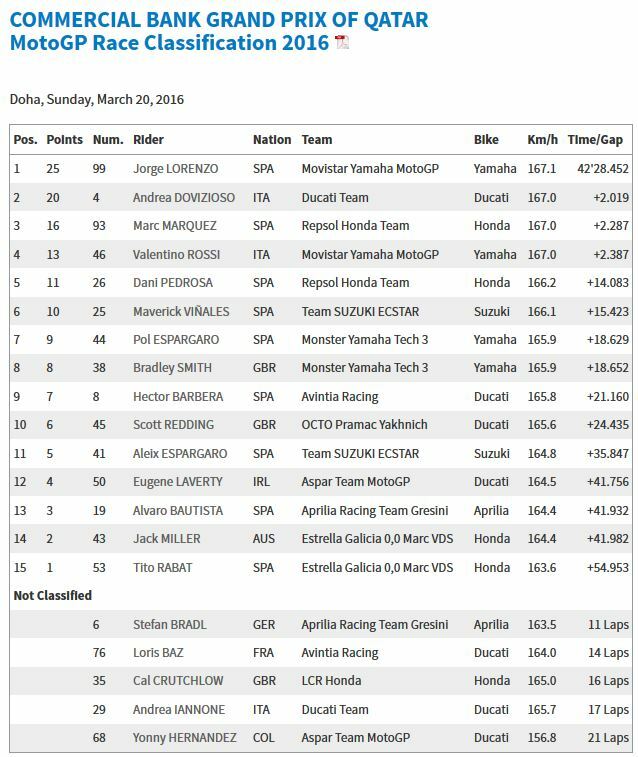 After the opening corners, Lorenzo led with Iannone and Andrea Dovizioso (Ducati Team) behind, the Desmosedici GP again starting well in Qatar. Meanwhile Rossi looked on in fourth. The top end speed of the Ducati proved a force to be reckoned with as both Iannone and Dovizioso blasted past Lorenzo on the straight, dropping the World Champion to third as they ended the first lap. 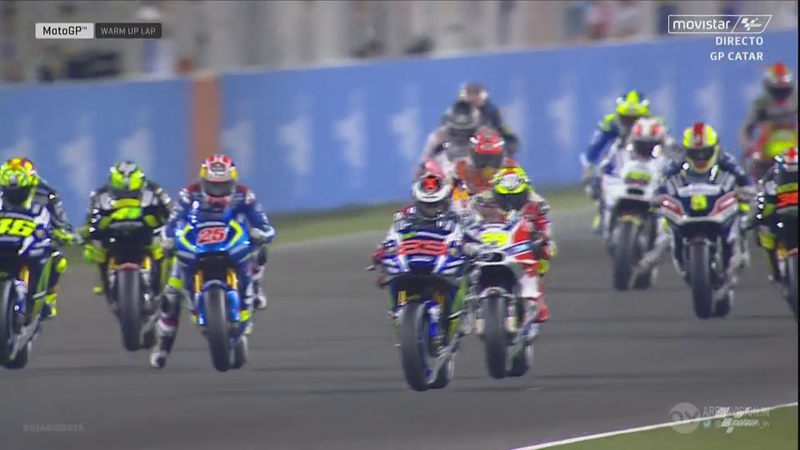 At the back of the leading trio, Rossi stayed just ahead of Marquez as all five began to settle into their rhythms. It was Andrea Iannone who led across the line, both he and Dovizioso able to open up a lead of several tenths over the pursuing Yamaha pair. Meanwhile Pedrosa and Viñales, sixth and seventh, attempted to close the gap. At Turn 6 on lap three Marquez slid up the inside of Rossi to grab fourth, Rossi dropped back slightly after the pass, 0.3s from Marquez. 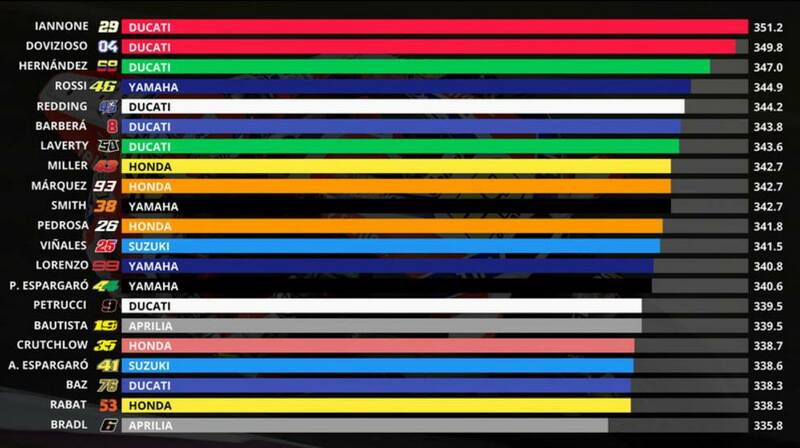 Fastest lap after fastest lap couldn’t split the top five, the Michelin tyres improving with each lap. On the sixth lap ‘Desmo Dovi’ tried to take the lead but was quickly pushed back by an aggressive move from his teammate, living up his nickname of ‘The Maniac’ but Dovizioso wasn’t deterred and struck again later in the lap. Pushing harder and harder, Iannone suffered a fast fall at Turn 13 as he attempted to go up the inside of his teammate. Although he was unhurt, not finishing was a bitter pill to swallow. His fall was soon followed by Cal Crutchlow (LCR Honda) who crashed out of the race at Turn 4. 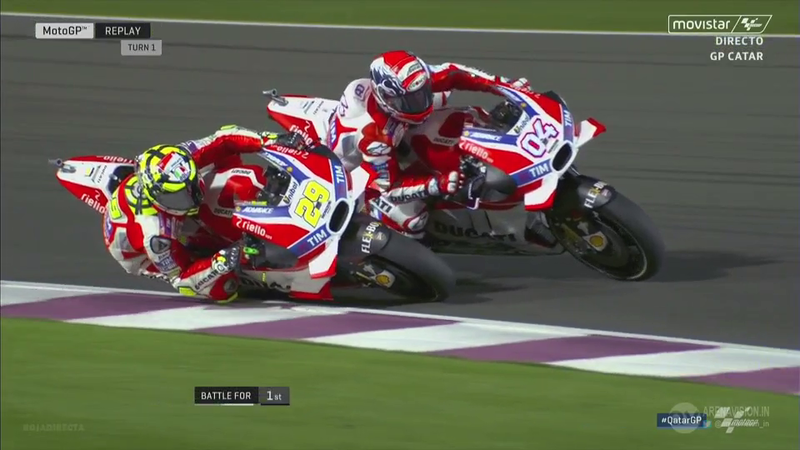 With Iannone gone, Lorenzo took up the challenge and pushed Dovizioso hard for the lead. Dovizioso was regularly at least 5km/h faster down the straight than Lorenzo, but on lap nine the Majorcan struck and went into the lead. A small gap emerged, allowing Lorenzo to maintain his lead even down the straight. A string of fastest laps of the race followed as the Qatar GP entered the middle laps, both Lorenzo and Dovizioso exchanging fastest laps of the race. 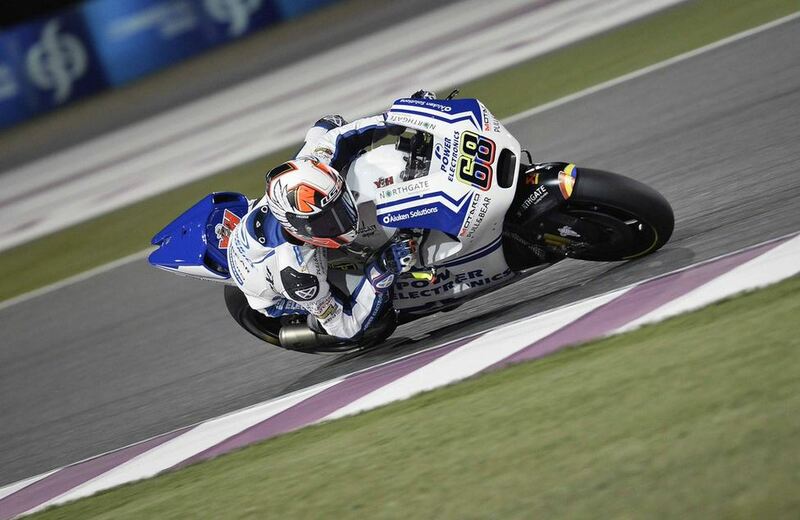 By mid race Lorenzo had an advantage of over 0.3s, working hard to stay ahead. Neither Marquez nor Rossi were able to make a serious impression on the leading pair, Rossi appeared to be fading away but then produced a 1’55.281 on the 14th lap of the race. The Michelin tyres went the distance as riders throughout the field were setting personal bests and fastest race laps till the end. As the race entered its final five laps, Marquez closed in on Dovizioso for second as Lorenzo maintained and extended a half second lead to a second. With four laps to go Marquez effortlessly slid up the inside of Dovizioso to move into second. Marquez tried to close in on Lorenzo but soon found himself in the company of Dovizioso and Rossi once more. As the riders charged down the straight to begin the final lap Dovizioso passed Marquez into Turn 1. Lorenzo would eventually cross the line a dominant 2.019s ahead of second, Dovizioso repeating his second place finish of 2015 after Marquez tried to pass in the last corner. The Spaniard settled for third with Valentino Rossi 0.1s behind in fourth. Dani Pedrosa completed the top five but was over 13 seconds back on the race winner. Viñales, Pol Espargaro (Monster Yamaha Tech 3), Bradley Smith (Monster Yamaha Tech 3), Hector Barbera (Avintia Racing) and Scott Redding (Octo Pramac Yakhnich) completed the top ten. 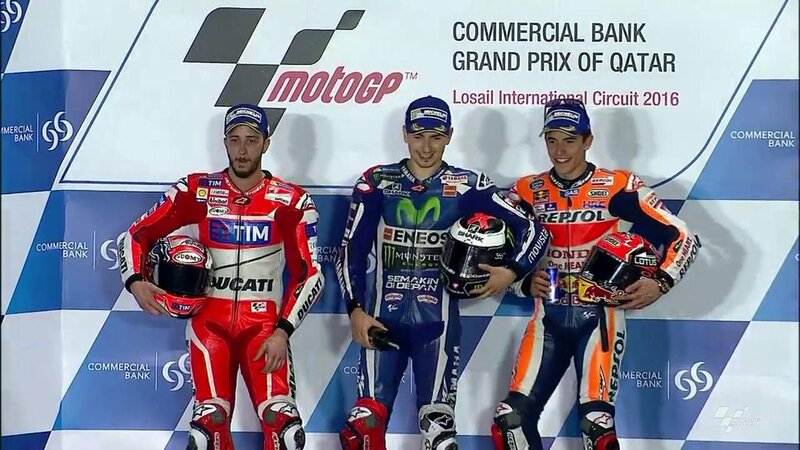 The fastest lap of the race went to Lorenzo who set a 1’54.927 on the 20th lap. 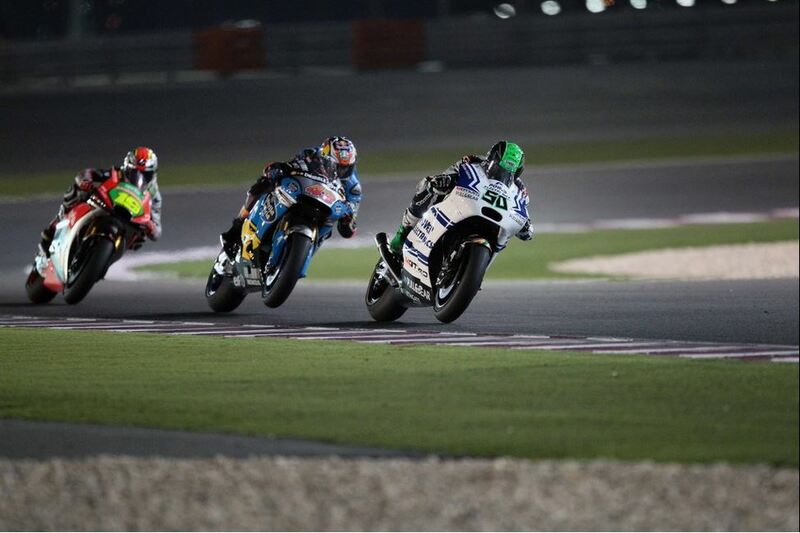 There were further crashes for Loris Baz (Avintia Racing) and Stefan Bradl (Aprilia Racing Team Gresini). Both were unhurt. Lorenzo leaves the opening race leading the championship with 25 points. The MotoGP™ World Championship are back on track on the first of April for Free Practice 1 of the Gran Premio Motul de la República Argentina.